Первая монографическая ревизия рода Мирмика (Myrmica) Старого Света, включающая описания 142 современных и 5 ископаемых видов. Даны определительные ключи для 7 регионов и 332 иллюстрации для них, 162 карты распространения. This about 800 pages monograph is more than a traditional taxonomic review, it gives the history of the taxonomic treatment of Myrmica, summarises the current knowledge of the social biology and ecology of the genus, analyses the zoogeography of the various species and outlines the author’s views on the evolution and speciation within the genus. The authors currently recognise 142 extant and 5 extinct species from the Old World and they provide Identification Keys to the species for each of seven geographic regions. This should make the Keys more user-friendly for non-specialists. The locations of the type specimens are noted in the taxonomic catalogue, which is arranged alphabetically by species, as are the accurate line-drawings of every species. These illustrate features such as the shape and sculpture of the head and body, used in the identification keys. This arrangement makes it easy to find the data for any particular species. There is a full list of all names ascribed to genus Myrmica and a table of synonyms from among the valid names is provided. The etymology of many of the names is interesting and provides insights to thoughts of the original authors as does the short biographies are made for all authors of more than one valid species of Myrmica. The authors believe that there are many species of Myrmica yet to be discovered, particularly in the Indo-Oriental regions and in the southern mountains of Eurasia. This book provides the essential starting point for future studies. Radchenko is one of Europe’s leading ant taxonomists and an expert on the ant fauna of the Palaearctic, while Elmes is an ecologist and eco-physiologist who has made a particular study of Myrmica ants over a 45 year career. 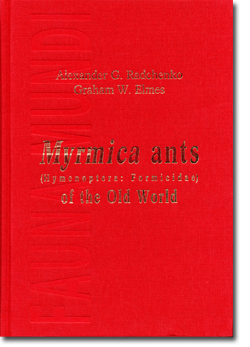 "Graham Elmes was a former colleague and I know that he is the foremost expert on the ecology and biology of Myrmica ants, while Alexander Radchenko has an unrivalled grasp of the world-wide taxonomy of this fascinating and important ant genus. Together they have surely produced a unique synthesis of the biology and taxonomy of Myrmica."